For so many years, I thought the Hubster loved carrots. Like, really loved them. In every single meal involving carrots, he'd eat the carrots first. He wouldn't just eat them. No, he'd devour them quickly and with gusto. If we were eating Japanese curry with beef, carrots and potatoes, he'd eat the carrots first. Pot roast? The man pushed the meat to the side to eat the carrots. Stir fry? You guessed it. He left the chicken and broccoli in favor of the carrots. The man was a carrot loving machine. So one day, instead of packing him a lunch of grilled chicken and veggies, I packed him a lunch of chicken and carrots. The Hubster came home that night and said, "Wow, were you mad when you packed my lunch?" And I said, "No, why?" And he furrowed his brow and said, "Because I hate carrots and when I saw my lunch, I figured you must be trying to send me a message." Turns out he ate the carrots first so he could get them off his plate as fast as possible. This was a bit heartbreaking for me because I happen to love carrots. Growing up, I ate so many carrots my palms would often turn orange. This love of carrots is a bit ironic because I started wearing glasses at a fairly young age and the Hubster still has perfect vision. Go figure. Glasses aside, I've been on a bit of a mission to convince the Hubster to love, heck at least like carrots. Thus far, the mission has been wholly unsuccessful. I've tried including carrots in Ottolenghi's fritters and baking carrot muffins. I've even made really fantastic carrot pancakes and yet, no dice. The man is not budging in his utter dislike of carrots. Until this past weekend, of course. 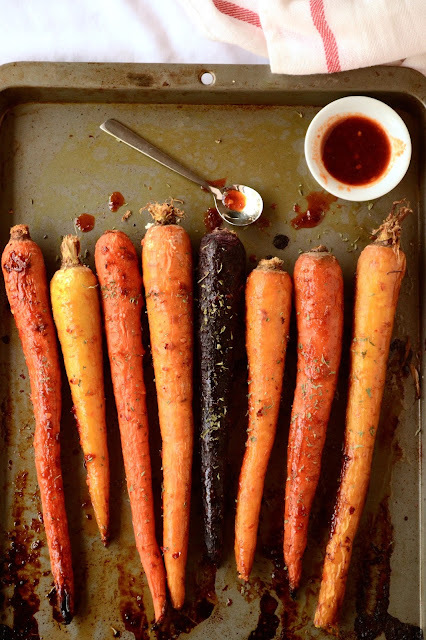 Allow me to introduce these Honey Roasted Sriracha Carrots. Did I spend the extra few bucks buying the fancy multicolored carrots at the farmer's market? Why, yes. Yes, I did. My theory is, why buy designer shoes and bags when you can spend your money on fancy carrots. Did these fancy carrots taste any different than the regular ol' orange carrots that are $3 for a massive bag at my local grocery store? No, but let's not get caught up in the minutiae. We're here to discuss the best carrots in the world. These carrots are brushed with a sweet and spicy glaze and baked until they're tender. Remember those cooked, mushy carrots from your childhood? These aren't it. 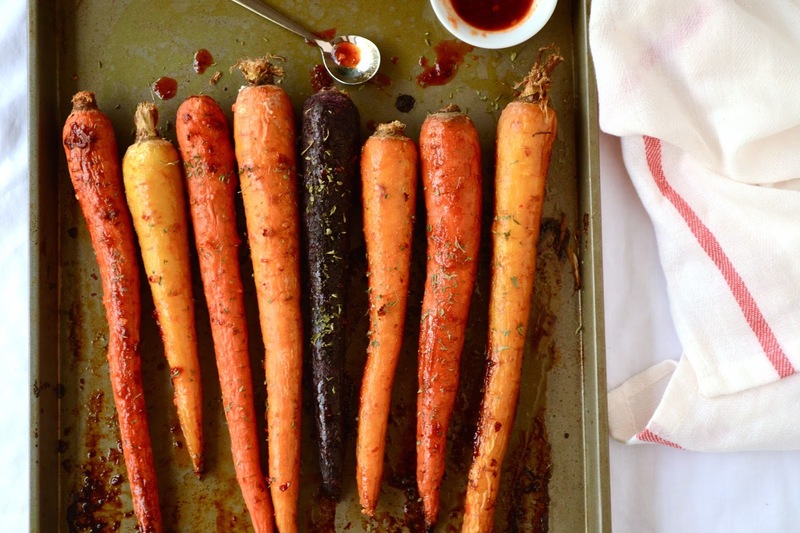 These carrots come out of the oven perfectly roasted and charred in spots. And just when you think they can't get any better, the remaining sticky, savory glaze is poured on top right before serving. The result is a magical carrot dish that is quick enough for a weeknight vegetable, gorgeous enough for your Thanksgiving menu, and most importantly, Hubster approved. Grease a large cookie sheet with oil. Scrub carrots with a vegetable brush, rinse, and dry thoroughly with a paper towel. In a small mixing bowl, mix remaining ingredients for the glaze. Place carrots on tray and brush with half of the glaze (while you're brushing the carrots, flip the carrots around to make sure you get glaze on all sides). Bake for 20-25 minutes, or until carrots are tender when pierced with a fork. Do not panic if some of the glaze runs off the carrots and burns on the cookie sheet. This is normal and not cause for the theatrical, "Oh my god, the carrots are ruiiiiiiiiiined!" Not that I would ever do that. Remove carrots from oven. Place on large serving platter and brush with remaining glaze. Sweet and spicy carrots! love it! P.s how have you been? It's been a while since we have chatted on social media! Hi Sana! It's so good to chat again! I hope you've been well! Fun story! If I don't like something, I'll just sample it. But carrots get devoured -- just love them. Going to make a pot roast this weekend, so of course I'll include carrots. Love the spiciness of your roasted carrots -- really good recipe. Thanks! Oh man, now you have me dreaming of pot roast. At almost 11 p.m.
That made me laugh!! I identify though... I always eat the least favorite thing on my plate first. Carrots I'm a fan of though, and these look awesome! I had to laugh at your hubby-carrot story -- poor guy! He must have thought he did something wrong ;) I happen to love carrots in any form, but especially cooked because it seems to draw out the natural sweetness. Your recipe looks amazing -- and colorful! Right?! I've been on a huge roasting kick lately so it just made so much sense to roast carrots! I love carrots but have terrible eyesight too. My husband hardly touches a vegetable of any kind and his eyesight is nearly perfect. Are they on to something?? Haha - my daughter does the same thing with olives! She polishes them off first so she can savor what she loves! As for these carrots - they sound so delicious - I've never combined sriracha with carrots before - thanks so much for the idea! I never thought of roasting carrots, sounds so yummy! That's my favorite way to eat 'em these days! Roasted carrots also work really well on a salad or on top of rice.